A few pictures from our Saturday, the springiest day we've had yet! Fresh rhubarb I found at the market! I can't wait to turn it into this. Garden seeds purchased at the local agricultural co-op. I am especially excited for the pickling cukes, mini pumpkins and the lovely lupines! A new hand soap for my kitchen sink - Mrs. Meyer's newest scent: Apple. Heavenly! Bill had the boys out in the yard today - which is nearly snow-free - to start the cleanup. Little Bear is just getting over a nasty virus (high fever, runny nose) but he was loving the fresh air ... and the plentiful "sticks." 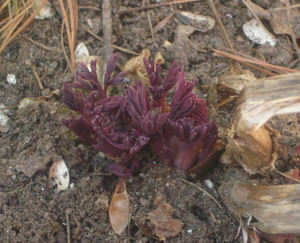 Beautiful purple crocus growing out back. Our vernal pool out front ... pretty soon it will be peeping! Some of you on Facebook saw my post this morning about my sunrise walk with Earlybird. Truly, it was magical. 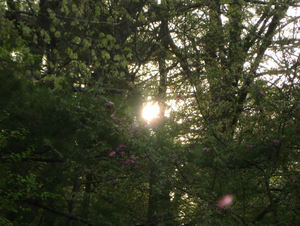 The day was just getting light and the sun was glowing warmly behind the woods ... we could hear so many songbirds! And ducks ... crows ... geese ... a woodpecker! It was a lovely way to start our day and I felt such a reconnection with the world. I did enjoy the long, snowy Winter (honestly!) 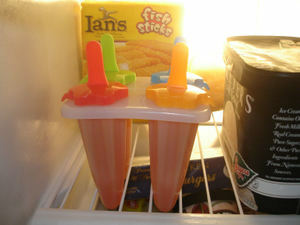 but goodness, I am ready for Spring! Dear friends, I hope you are all having a nice weekend - wherever you are and whatever your weather. Another nice day on tap for us tomorrow - and by Monday it will be 70! Who doesn't love a good mystery? It's human nature isn't it? People are curious and drawn to discover - and thereby learn more about the world around them. Mysteries present a perfect opportunity to do just that - to expand our understanding and change our perceptions. Best of all, mysteries provide plenty of good mental exercise! And where can mysteries be found, at anytime of year, but perhaps more so in the summer than ever? Why, right in our very own backyards! Why did six blue jays sit in the spruce tree and coo at each other? Why is the catbird so antsy this morning, flitting about? What made that very loud, very odd noise in the woods last night? 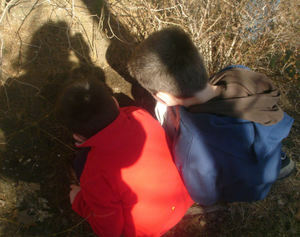 Building upon this instinct to wonder and detect, wouldn't it be fun to begin a Nature Detectives Club this summer? This could be done in several ways, depending on level of enthusiasm and number of interested parties. You could do this within your own family; each child seeking out a mystery to share at a family meeting. Or, working together, mother could do this with the children through the week and then make a presentation to father on Saturday. How about inviting some friends to take part? Assemble a few families together, each one bringing their "evidence" which could be photographs, sketches, or just an experience to describe aloud. Let the children talk it out and share their opinions, offer advice. 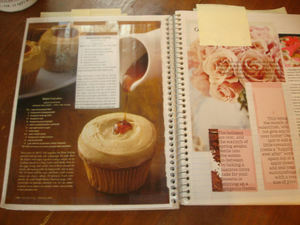 Start a notebook just for your detective work. Assemble a kit with magnifying glasses, binoculars, field guides, storage containers and bug inspection devices. You could have your club meet once a month or once a week, or even share things online via email if necessary. Why not publish a newsletter?! I know some children are hesitant to delve into nature study, but this mystery angle strikes me as a way to appeal to the innate love of a good mystery. I think it might be a particularly boy-friendly activity, as well. 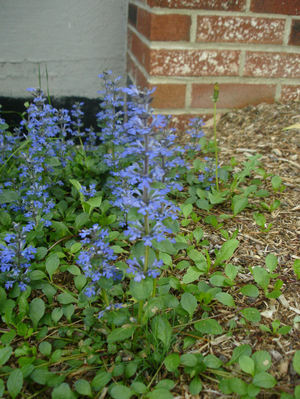 With all that in mind, here are some recent photos we took in our yard, several which have us scratching our heads. These wood shavings indicate some drilling - but what drills holes in wood? This situation caught my eye quite early this morning. From the kitchen window I noticed our hanging petunia had spider webbing all about it, between the planter and the deck railing. 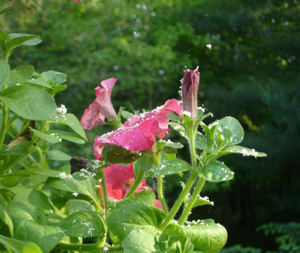 Going out to investigate, and photograph, I noticed a fine white dust all over the plant and the deck. What on earth? Something drilled a hole in a board that sticks out from the corner of the house just above the hanging plant. So the question is - what did it? A wasp or a spider? 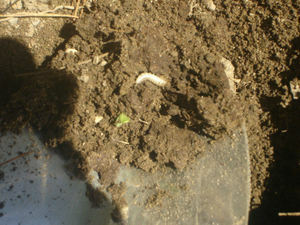 Here's what we found beneath the picnic table on Monday. We know it's a wasp nest, but what kind? 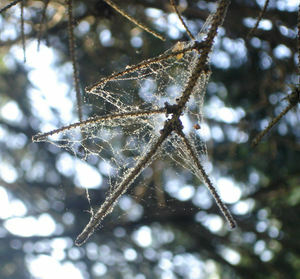 This is some intricate and interesting webbing at the tip of a spruce branch. We only noticed it last evening as the setting sun shone through it. It seems an odd spot for a web; said spider must not realize this area is birdfeeding central. 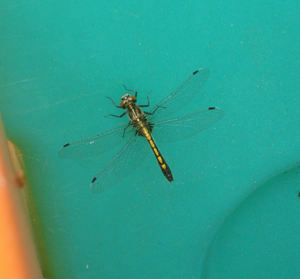 Our first dragonfly of the season - ah, but what kind? And a beetle of some sort. We'll look him up online. 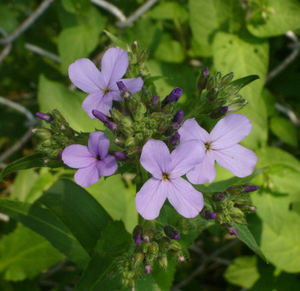 A blossoming wildflower - it's all around our back fence, but I have no idea what exactly it is. 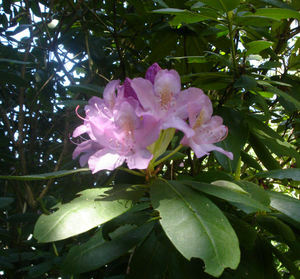 The rhododendron is opening its lovely blossoms. I was surprised to notice the orange speckling inside the petals as I opened the photo - pollen or markings? Also, one whole portion of the shrub has died off, which is a pity as well as a mystery. 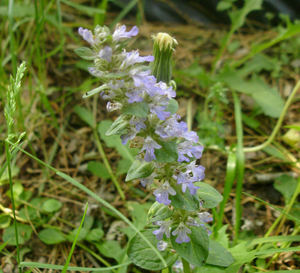 A new weed growing in the backyard - tiny yellow flowers with an interesting shape. 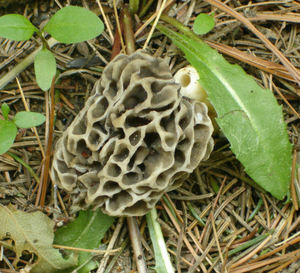 Last year we had lots of morel mushrooms growing in the shade of our family room addition; this year, just one. We guess it's because it was a drier spring this year. 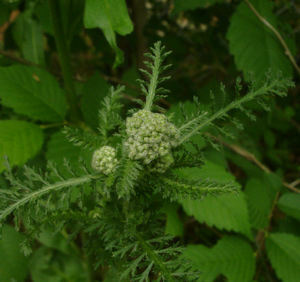 Same plant - according to petal and leaf shape. But what is it, and what accounts for the shade variation? 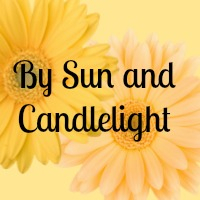 Sunlight perhaps? The tip of a fern - gone to seed? Or something else? 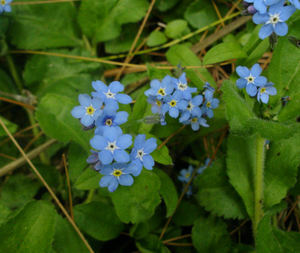 Forget-me-nots in the shade garden - some with white centers, some with yellow! What's the difference, we wonder? 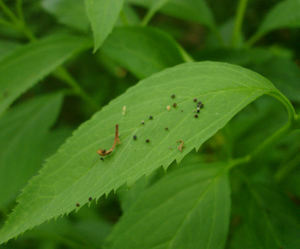 On this leaf are tiny black seeds (?) that are all over the yard. Obviously dropping from some tree - but which one? And last but not least, last night's almost-full moon. 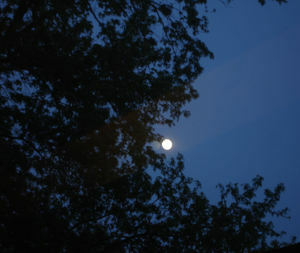 Today we'll check on the exact time for fullness - and just what is meant by the term "blue moon" (as this one will be!). Well, those are the mysteries for now - plenty to keep us pondering, researching, guessing and, ultimately, learning. A great skill set to bring to all aspects of life! 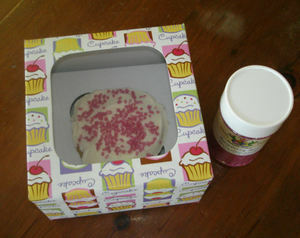 I have to tell you, EB did very well with this "bringing and giving of the cupcake." Six months ago, I probably would have hesitated to have him do this. It would have too likely become an issue - the emotions would run too high. He'd be all excited to give it, then he wouldn't want to give it - he'd hand it over, then he'd want it back. Any number of little problems could have cropped up, and that's not what you want when your child is preparing for therapy. Better to keep things simple. But EB's made nice progress with language, patience and social skills, so I figured why not give it a whirl. He helped me package it up and he carried it all the way from house to van to waiting room (at which point it was briefly left on a chair). He did try to open the box once or twice but I reminded him that he wanted to keep it closed tight so it would stay fresh. This seemed reasonable to him (in the past, it might have sparked a fit). And when his therapist walked in to get him, he ran over to her, grinning ear to ear, box in hand and said, "Here you go!" 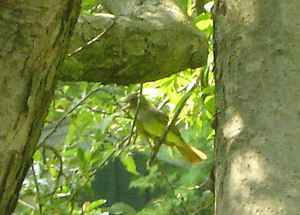 Could be a Great Crested Flycatcher? 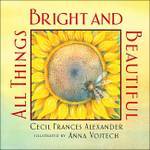 He had a crested grayish head, and was kind of yellowish all over but with brownish wings and a soft red tail. His shape was distinctly different from a cardinal - but his head reminded me of a phoebe, the only other flycatcher with which I'm at all familiar. This is quite exciting - so many new species in so few weeks! In case you hadn't heard, today is the 30th anniversary of Star Wars! Wow, that makes me feel ... well, not young, lol Sometime this weekend, we'll make a batch of popcorn and watch the original movie with the boys. (I hesitate to say the first movie, because Bookworm always points out that technically, the first movie is really the fourth movie, and if you're a Star Wars fan, you know what I mean.) I'm sure Crackerjack will dig out all his Star Wars action figures and before the weekend is over we'll see a light saber duel or two. Speaking of movies, Bill and I will be going to see the new Pirates movie sometime this weekend (can't wait!). And speaking of Crackerjack, he's all excited because I am taking him to Target tomorrow where he will be allowed to buy a toy with some of his First Communion gift money. Goodness - will he pick an action figure or a matchbox car? Pokemon cards or a Lego? Oh, my he can hardly wait! Well, I must wrap up and let you get on with your wekeend. :) I can hardly believe it's Memorial Day already. I can remember growing up, during the week leading up to the holiday, my grandma always made the rounds of the family cemeteries. I often went with her, and we'd water the plants, add a few new ones, and tidy up the area around the graves. It wasn't sad or spooky to me - on the contrary, I enjoyed the visits because grandma told me all kinds of family stories, and I enjoyed them very much. I especially loved hearing about her life growing up with eight siblings, the Great Depression and what it was like when she was a young mother. I think I'll plan a visit to see Gram this weeked. She doesn't get out much, but at 93, her stories are still as wonderful as ever. I hope your weekend is just lovely! Happy Friday! I also love how we begin our mornings. So quietly, so slowly. The light is just creeping through the woods, and my boys are still asleep. I like to raise their windows so that as they wake, they feel the gentle breeze and hear the wakening woods. I think it is a comforting and cozy way to start their day. In the winter of course, I can only crack the windows (if at all) but our temperatures have been in the 80s lately, and so we are having a touch of summer here in mid-May. Today, as soon as the soft light worked its way through our house, I made the rounds from room to room lifting blinds and throwing windows open wide. The day was dawning so beautifully. The woods were literally alive with all the bird song and yet, one call lifted clearly and loudly above the rest. Crackerjack and I had been listening to that song, wondering what bird could be making so piercing and distinctive a call. A few moments later, as I made Earlybird's bed, I heard the song even more clearly and called CJ to the window. 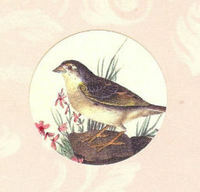 There, sitting on the gate just outside EB's window, was a tiny Carolina wren, singing his dear little heart out! We were so close we could see his beak moving, notice the way he tilted his head back as far as he could in order to belt out his call as boldly as possible. We watched him for several minutes, marveling at his tiny perfection. This impossibly small bird has such a large voice! In just another minute he was joined by a second wren, who could only be his true ladylove, and together they flew into our neighbor's shrubbery. Amazingly, at the very same moment, a young cardinal pair met up on the fence post and followed suit, heading for the very same shrubbery! "That must be their church," said Crackerjack. "It's marrying day!" A few moments later, the same bird I had glimpsed turned up at the feeders and CJ and I got a closer look. It was definitely an Eastern Towhee, a spring migrant who visited us this same time last year! 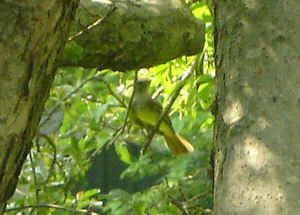 A female, according the description in our trusty Birds of New England. Her song was a clear and charming cherreee! 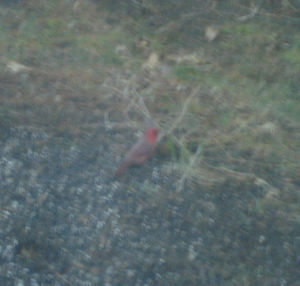 I took some pictures through the dining room windows, but they all came out quite blurry. Hopefully she'll stop by again - perhaps she's making a nest nearby? How exciting to have so much activity here so early in the morning! It's just barely 7 a.m.! Now the boys are all up and we're sharing our stories with the sleepyheads who missed the excitement. I've just come from the front door where we waved Daddy off on his day. Up and down the street neighbors are hauling trash bins to the sidewalk and pulling cars out of their driveways. A school bus just trundled by. The quiet has been replaced by the bustle of the workaday unfolding. The Blue Jays are calling from the treetops and the squirrels have made it to the feeders. Our early morning time has passed. Really, there's just no time like the earliest hours for observing the beautiful and sometimes surprising nature all around us! But let's keep our eyes peeled, because I am sure there will be more to see before this day is done. I hope your day today is just lovely, perhaps filled with a nature moment or two! Despite the presence of a second full moon this month, we will herald tonight's moon as the Full Flower Moon. We're having heavy rain this morning, but hopefully things will clear out this evening before moonrise at 8:29 p.m. If you're keeping a nature notebook with your children, it might be nice to draw a page showing the full moon and fill it with pictures of flowers (hand-drawn, stickers or magazine clippings). Label the time and the name of the moon, perhaps even add some information about the blue moon theory ~ and how about a poem just for May's moon? A beautiful deer! It was eating grass, twitching its ears and flicking its tail - gorgeous! - and here I was in the doorway trying to get a good picture through the glass, when it suddenly startled and ran off to the left, into the woods. We all ran to the back windows, to follow its path, and realized there were three more deer, and they were directly behind our house! Oh, the close-ups I could have been getting had I looked out these windows first! 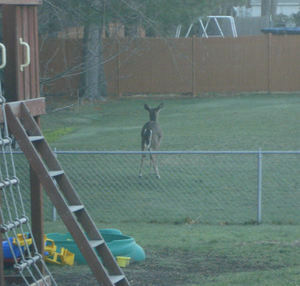 One deer was quite small and speckled ~ a fawn, perhaps? Ah, well. We watched them leap off into the woods, grateful for that sweet, brief encounter. They stood at a distance out in the woods, just looking back at our house (right at us, it seemed), with the sun beginning to pore through the branches behind them ... it was quite a sight to behold! What a way to start the new day! As the boys made their way towards the kitchen for breakfast, I made my rounds of the "bird windows," and was delighted to watch a pair of cardinals taking their own breakfast under the cherry tree! 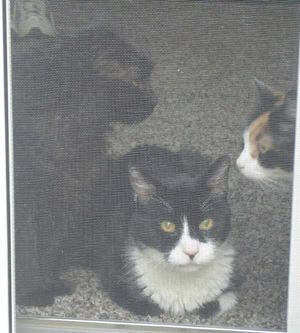 These photos (taken through a screened window) are terribly blurry, but I had to post them, just to show you our sweet pair. If you squint a little, you can just make out the female standing behind the male. 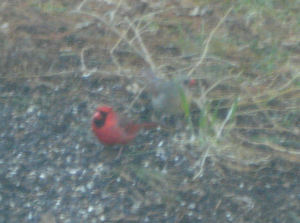 They were pecking seeds off the ground (where I spilled a considerable amount yesterday while filling the feeders). Watching closely, I realized he was pecking seeds and feeding her! Actually, I'm sure you probably can't, but she is just behind him in this picture and he is placing a seed in her beak. It was the dearest thing. All of this happened within 10 minutes of waking, and it only underscored a few of the points we discussed at my nature study meeting last night. 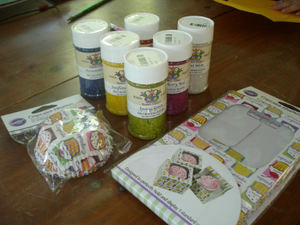 I have some pictures and notes to share, but will have to wait until later today to do so. We're off to speech bright and early this morning. Thank you to everyone who left comments and questions about nature study yesterday. I think I will begin a series of posts in which we address your various thoughts and queries. 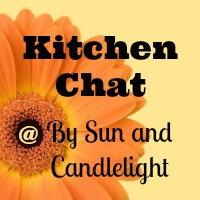 It would be fun to share ideas and suggestions with each other! In the meantime, as always, thanks for taking the time to stop by and read, and have a great morning! Today we're going to muck about a little in the yard. 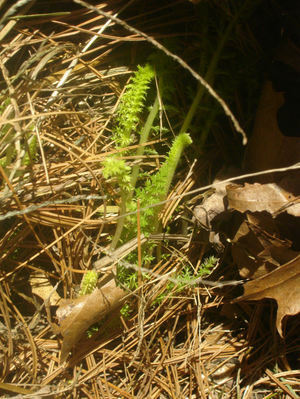 The ground is softening, the earth smells fresh ... what better time than early spring to dig a bit and look for new life? For it's certainly stirring now, and in all kinds of places. Sometimes it's plain to see - a nest in a tree, buds on a bush, a bee flying by. But there's a whole lot going on in places we hardly ever think to look. Or at least, I hardly ever think to look - anymore (I did as a youngster I'm sure). No, usually my first instinct upon discovering a pile of withered, slimy leaves is not to poke around under there - Heaven only knows what might come crawling out! But of course, that's the point. And when we do get down and close up, and carefully lift and look, what we see is almost always amazing. My young boys seem to know, instinctively, where to go to find the neatest bugs, worms and other cool creatures at this time of year. They gravitate towards the muddy and messy areas of the yard and they are richly rewarded in their exploration. Today it would be fun to meander around the backyard and lift up things like rocks, logs, piles of leaf litter or even toys that have perhaps spent the winter months parked in one spot. What might you find? Ask the children to ponder: why is there nothing green growing under there? 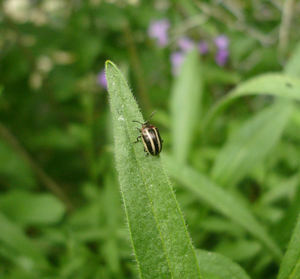 Take a small field guide with you if you'd like (an insect guide would be helpful). Equip the children with magnifying glasses and a small clean jar. Let them dig around and explore for a while. Guide them to move slowly and quietly so as not to harm any living thing (they'll also get to see more if they're careful). If they find a small creature they'd like to observe, carefully deposit it into the jar, making sure to add a bit of soil first. Before I sign off, just a quick word about my Everyday Nature posts. I don't want you all to think I'm some kind of nature expert. Oh, so far from it. I am decidely not a very outdoorsy person, in fact. I don't camp (yet), don't hike (much), don't canoe (ever) or do any of those other rugged wilderness things. But I do love nature. I love my small habitat and getting to know it better. I love showing my boys the wonders of nature, and specifically that which is right under our feet, outside our door, in view from our windows - every single glorious day. There's so much to learn and even more to love. I think of Everyday Nature as baby steps towards nature study. It really can be as simple as taking five minutes a day to just be aware. Some days we might spend an hour walking through the woods, identifying trees and listening for birds. Some days we might just open a window and feel the wind change as a front moves through. It all adds up, in my book. And it is all a gift, every little bit. If the weather is accomodating, head out for a leisurely nature walk. You need to bring nothing more than your keen senses with you (though you could of course bring a camera or sketch pad). Smell the new grass, hear the birds in the trees, look around and see the beauty of our world. 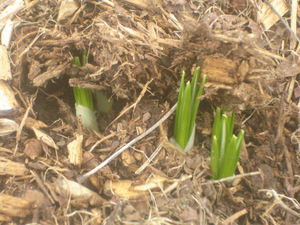 Look, in particular, for little signs of life returning from the depths of winter. And for everything you see, every little thing you marvel over, give thanks to God for the world He created for us. When the children return home, have the crayons and paper set out. Let them make a Praise Poster - filled with all the things they saw on their walk. Write Praise God in bold letters at the top (glittered, perhaps) and hang it near your dinner table. Include these beautiful images in your Easter grace tomorrow. Now, if the weather is not accomodating, your children can still participate in a Praise Walk ~ just have them sit by a window and gaze out upon the world. From where they sit they can surely see many lovely things to be thankful for. They might start with the rain itself, and remember how precious it is to our earth and its creatures. Simply put, a Praise Walk is a nature walk, but today we bring fresh eyes to the landscape, and we seek out more than just a new flower or the toad underfoot. Today we leave our field guides behind and let our hearts lead the way. Set up a bird bath or other water supply. Schedule a trip to a local birdfeeding store. The seed sold here is usually of a much higher quality than the bags you pick up at the superstore (less filler and debris). Also, you can pick the brains of the shop owners, who are more than likely bird enthusiasts with a wealth of knowledge to share. Talk with them about spring feeding and show them your wish list. Ask for suggestions on specific feed and plantings. Here's a great bird-fruit chart. Before the trees bud out, take a nest walk. Bring along the binoculars (and the camera, of course) and look for nests in the treetops and brush. Plan a trip to the pond to observe swans, ducks or geese nesting (from a distance). 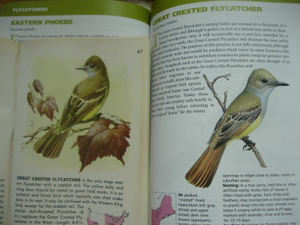 A home bird study tip: We use coloring books (such as this one and this) to aid in our bird study. If we see a bird, we look it up in the coloring book, photocopy the page, color it in, and add it to the nature notebook with notes from the sighting. A lovely online bird coloring book is here. Despite the impending snow, it certainly felt like March today ... gray, drizzly, and mild. It's been nice to have the windows cracked open, for the breeze is kinder than it was a month ago. The woods are damp with snowmelt and lively with birdsong. 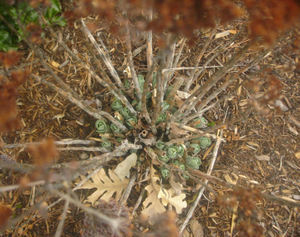 Newly sprung from its frosty pen, the earth smells - well - earthy. However removed we are from nature in our everyday life, we know in our bones, spring is near. Here in New England, March means maple sugaring time. We don't have any sugar maples on our property, but if the storm clears out in time, we are planning to attend a local sugaring demonstration this weekend! I can hardly wait - I cannot believe I have lived practically my entire life in New England and I have never been to a sugaring demonstration. I thought the experience would make a nice entry in our nature notebooks. So today we kicked off our maple study on a rather (sugar) high note. 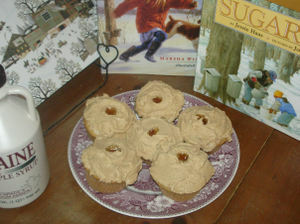 While I prepared delicous maple cupcakes, we played the Maple Leaf Ragg and we talked about trees in general, in light of their role as a natural resource. We began with a quick brainstorm: How do trees help us? We'll see what else develops after our "field trip" this weekend. We'll take lots of pictures of course - though I think it will be too cold and slushy to do much sketching while we're there. I wish we had a sugar maple we could visit year round as is suggested in the Handbook of Nature Study. It is the perfect time of year to "adopt" a tree - and watch it grow through the seasons. If you're interested in learning more about maple sugaring, you might check out any of the titles I have listed in my Early Spring Basket on the righthand sidebar. (Still to add: The Big Tree and Ox-Cart Man). The Handbook has a wonderful Maple Sugaring chapter, and Project Seasons has many interesting activities (including maple math!). There is also an incredibly complete unit study I found online here. 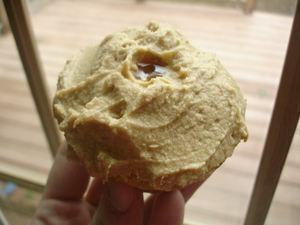 And, if you are intrested in making the maple cupcakes, the link for the recipe is here.